The owners of a new vape store came to us wanting a logo and branding image that portrayed the company’s name. Working from a Humphrey Bogart project base idea we created their logo. From the logo we turned to storefront branding, business cards, product tags, banners, and vehicle wraps. 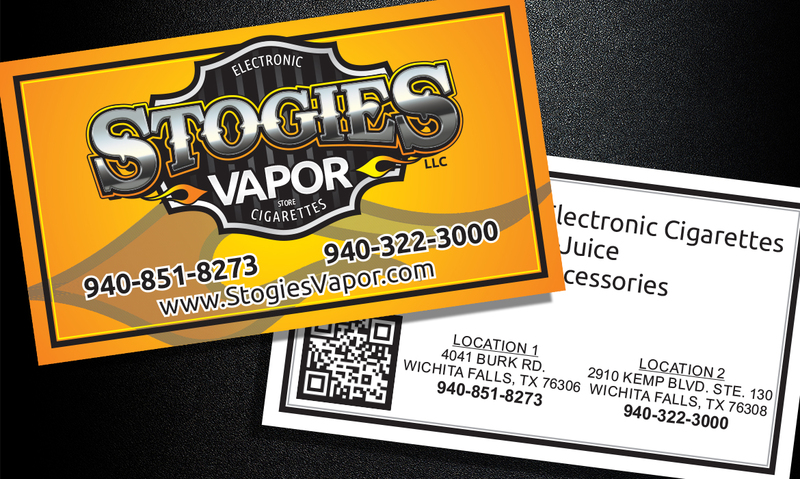 Stogies is a great example of starting with a professional logo and building a brand around that logo. From concept to final production, Stogie’s kept their branding constant and built a brand around a great logo. It’s always smart and economically prudent to start with a professional logo and build from there. Initial concept began around an idea of Humphrey Bogart and a lady with a wide brim hat exhaling a white vapor smoke. Revisions in this project came as the company began to grow and needed to incorporate a LLC title and later distinguish itself as a store. Strong brands build excellent results. Stogie’s started with a strong brand and built their organization around that brand. The results are evident every day as Stogie’s continues to get noticed in an industry that has been overrun with companies trying to get a piece of the vape market.